As responsible dog owners, it is our duty to take good care of the health of our dogs. It is our responsibility to give them the best glucosamine for dogs, to keep their bones, hips, joints, and cartilages, healthy and optimally working. Degenerative joint disease (DJD), also known as Osteoarthritis, is a form of chronic joint inflammation, due to the constant degeneration of tissue, cartilage, and synovial fluid of the joints. It can either be acute or progressive in nature, and can affect both young and senior dogs. Dogs do not articulate well the pain that they may be experiencing, and they may not also be displaying their pain. This is why DJD is often discovered only at the latter stage of its progression. Arthritis is the inflammation of the joints, that are most common among senior dogs. Older dogs are at a higher risk to acquire this disease, because of the natural degeneration of bones. Arthritis can arise from the destruction, inflammation, and degeneration of joint tissue, which are usually preceded by infections or disorders of the immune system. Early signs of arthritis include subtle signs of discomfort and some changes in the behavior of your dog. Arthritis have similar symptoms previously mentioned for DJD. Hip dysplasia is the improper or “abnormal” growth development or formation of the ball and socket hip joint. Normally, as dogs grow, their ball and socket also grow at the same rate. Hip dysplasia occurs when the ball and the socket grow at different rates. This results to the two not properly fitting together, and thus, causes the hips to become out of place or loose. Hip dysplasia is considered as a hereditary disease. It is commonly found in large dog breeds such as Labrador Retrievers, German Shepherds, Rottweiler, among others. Dogs who have hip dysplasia usually find it difficult and painful to go from a lying position to a standing position. The dog may also limp while walking. There can be several ways to prevent and treat common joint diseases in dogs. Below are common treatments for your dog. It is always strongly recommended that you consult and discuss with your dog’s veterinarian about what is the best treatment for your dog’s condition, what to do and what not to do, and other specific instructions that are suited for your dog. An environment that promotes safety and comfort is one way to prevent joint diseases. While your pet is still a young, do not allow your puppy yet to over exercise before the bones and joints are fully mature. Exercise is important for the healthy growth of bones and joints, but the important key term is to not overdo it. Set up a space where your dog does not have to always jump so high to get to the sofa. This is especially important for senior dogs who may already find it difficult to jump on and off an elevated area. For dogs who are already experiencing bone and joint problems, it is better to set up ramps so they will not have a difficult time climbing up and down the stairs. Joint conditions are usually worsened when the environment or the weather is cold. Make sure to keep your dog warm, by providing a sweater or a blanket. Orthopedic dogs are best in preventing joint diseases and in relieving pain brought about by bone and joint diseases. These orthopedic beds reduce the pressure on joints. Obesity in dogs can be one of the main cause of acquiring joint diseases. Proper exercise that is done right is very important in keeping the muscles, bones, and joints healthy and strong. Exercise also helps in maintaining an ideal weight. It reduces risk of obesity, which may cause joint diseases. It is crucial that exercise programs are individualized for each dog. It will depend on his age, weight, physical condition, and severity of joint disease. Warm ups and cool downs are vital when exercising. Do not overfeed your dog. Feed according to your dog’s breed, size, activity level, and nutritional needs. An ideal weight should be maintained, to prevent the development of joint conditions that may stem from being overweight. Your dog’s veterinarian may prescribe anti-inflammatory drugs and pain relievers that will reduce swelling and discomfort. Please do not self-prescribe, and ask your veterinarian before giving your dog drugs. Hip replacement can be undergone by dogs who have hip dysplasia. Other joint replacement and surgical procedures are likely to be available in the future. There are supplements that especially target the bones and joints of dogs. They nourish the bones and joints, to keep them healthy and optimally working. Omega 3 fatty acid supplements have an anti-inflammatory effect, which is great for dogs who have bone and joint problems. Omega 4 fatty acid supplements also repair joint cartilages. Glucosamine is an important building block in the maintenance of joint cartilages of dogs. Glucosamine supplements are recognized to alleviate symptoms of joint diseases. They boost the restoration of damaged joint cartilage. Glucosamine is given to dogs who have joint problems. It alleviates pain associated to joint diseases, eases and helps in the recovery from joint surgery, and keeps the dog’s performance at an optimal level. There are no major food sources to get glucosamine. Thus, dogs usually get it from supplements. Most glucosamine supplements are derived from shells of crabs, oysters, and lobsters. Several researchers studied about the mechanisms of glucosamine, and how it really works. Experts theorize that glucosamine, through a form of supplement, somehow stimulates the DNA activity that protects against the degradation of joints, especially the cartilage. Glucosamine for dogs are available in different forms of oral intake, such as tablets, pills, powders, or liquids. Nowadays, there are glucosamine that can be given in the form of treats. Do NOT give human glucosamine supplements for your dog, for it may bring unwanted side effects to your pet. Glucosamine itself is harmless for both humans and dogs, but there may be incorporated ingredients in human supplements that is not recommended, and worse, toxic, for dogs. Humans and dogs also have different digestive system mechanisms. What humans can digest and absorb well, may not be true for dogs, and vice verse. Most veterinarians and experts recommend glucosamine dosage of approximately 500 mg per 25 pounds. You SHOULD consult with your dog’s veterinarian first for correct dosage and schedule of giving glucosamine. Glucosamine rarely have side effects, and can be avoided if you properly follow dosage and schedule recommended by your dog’s veterinarian. Occasional side effects, although not unheard of, are usually gastrointestinal in nature: vomiting, diarrhea, or constipation. Dogs who may be allergic to shellfish, may have food allergic reactions. 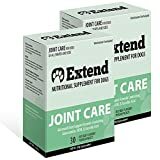 The Extend Pet Health Nutritional Supplement for Dogs is packed with pure-grade glucosamine, which make it an advanced joint support formula. Glucosamine content helps support mobility, comfort, and hydration. This supplement also contains Methylsulfonylmethane (MSM), Type II chicken collagen, and ascorbic acid. These ingredients maintains joint comfort, healthy articular cartilage, and connective tissue function. This nutritional supplement for dogs come in a delicious beef flavor. It can be given to dogs of all ages, breeds, and sizes. The Doggie Dailies Advances Hip & Joint Supplement claims to be not just delicious, but also complete with the essential minerals, vitamins, and nutrients that your dog needs to keep his hip and joints healthy. This supplement goes beyond the usual glucosamine supplement for dogs. Aside from glucosamine are 5 other ingredients: chondroitin, methylsulfonylmethane (MSM), hyaluronic acid, coenzyme Q10 and Yucca Schidigera. 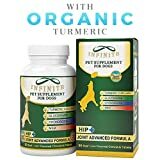 The combination of these six ingredients make it a complete supplement for dogs that promotes healthy hip and joints, supports healthy cartilage, increases mobility, eases discomfort and pain, and delivers essential nutrients. Lloyd and Lucy’s Hip and Joint Supplement for Dogs boasts to use only superior quality ingredients to bring better effectiveness for dogs. It contains 600 mg of Glucosamine, 300 mg of methylsulfonylmethane (MSM), 250 mg of Chondroitin, 100 mg of Vitamin C, and 5 mg of Manganese. The balance of these ingredients make it optimally reinforce the joint functions of dogs. 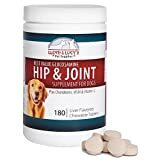 This joint supplement for dogs come in a liver-flavored chewable tablets, that Lloyd and Lucy’s are confident dogs will love. If your dog does not like the taste within 45 days, you may contact Lloyd and Lucy’s and they will refund your money -- that’s how confident they are of their yummylicious formula. 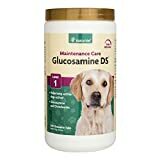 The NaturVet Maintenance Care Glucosamine DS contains glucosamine, chondroitin, and essential antioxidants, that support the structure of joints and connective tissues. These ingredients keep pets healthy and active, by maintaining healthy joint and cartilage functions. It is great even for younger dogs, prior to visible signs of joint problems. These tasty chewable tablets also contains Vitamins C and E, Yucca Schidigera, and Omega 3 and 6 fatty acids. There is no once glucosamine supplement for dogs that really works, and is effective for all. One may work well for some dogs, but it may cause some unwanted side effects to other dogs. With this in mind, there is no perfect glucosamine for dogs. 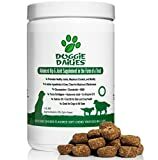 But, with all considerations taken into account, the best glucosamine for dogs is the Doggie Dailies Advanced Hip & Joint Supplement in the Form of a Treat. The pros heavily outweigh its cons. It contains the essential nutrients that keeps the hip and joint healthy, and also supports the overall health of dogs. It is also soft and chewable, which is great for dogs of any size to chew and digest.